NYFF review: Heartbreak and joy in "Heart of a Dog"
Pets are so much more than mere companions to their owners. They can be windows into the mysteries of the world, to those who have the inclination and patience to study animals' moods and behavior. They also become blank slates onto which people can assign their own aspirations, joy or fears. 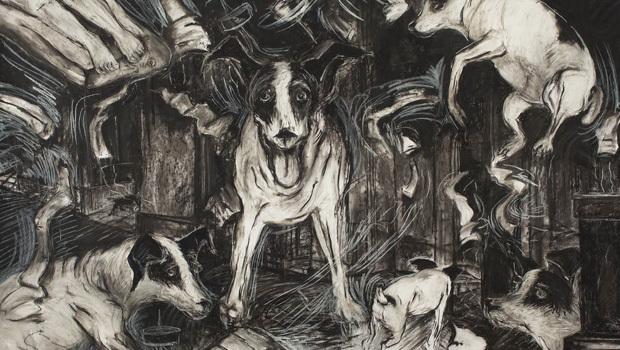 Performance artist Laurie Anderson composed her new film, "Heart of a Dog," as a fond remembrance of her rat terrier, Lolabelle. Seeing the world through Lolabelle's eyes (nothwithstanding that canines can only see blues and greens), Anderson learned to love her little dog "with a tenderness we didn't know we had." But the film is also her contemplation of mortality and the inversion layer between life and the after-life. The film (which bows Thursday at the 53rd New York Film Festival) blends memory and mysticism into an engrossing personal essay about life pre- and post-9/11. In one thoughtful passage, after the Twin Towers fell in Lower Manhattan, Anderson tells of taking Lolabelle to the shore. As they went on long walks together, swooping hawks who considered the little dog possible prey stirred in Lolabelle a new fear, coming from above. Anderson recognized that look, she says, as the new look of New Yorkers. "We have passed through a door, and we would never be going back." In addition to enjoying a shared life with the little dog (who was not only a welcome presence in her neighborhood but also quite talented as a keyboardist), Anderson, who was married to singer Lou Reed, recalls her childhood, her tangled relationship with her mother, and of friends who have passed. The film's beautifully-rendered animation is blended with paintings, video, 8mm home movies and collages of footage representing our world, surveillance cameras' capture and dissection of our experiences, and the transitional state (what the Tibetans refer to as the Bardo) through which the dying pass to whatever it is that awaits them. Lolabelle's death precipitates not only Facebook notifications from the dog's account, but also Anderson's meditations on Buddhist thought about death, empathy, and the power of stories -- stories of own lives, which we tell and re-tell, parse and edit, until they are comfortable, and only a portion of the truth. "You get your story and you hold onto it," Anderson says, "and every time you tell it you forget it more." The film is mesmerizing, and a little heart-wrenching -- and if you've ever had a pet, totally familiar. "Heart of a Dog," released by Abramorama, opens theatrically October 21, and will be telecast on HBO in 2016. The film is not rated. 75 mins. To watch a teaser click on the video player below. "Journey to the Shore" and "Cemetery of Splendour"